I often point out that on a few occasions easy money policy announcements have actually raised long term bond yields. But that’s obviously not always true. On the other hand persistently easy monetary policies that result in much faster trend NGDP growth do fairly consistently raise nominal rates. So why did Japanese bond yields fall on the recent moves to ease monetary policy? And why are they so low? The second question is easy, nominal rates in Japan are low because expected NGDP growth is very low, hence the Bank of Japan has a very tight monetary policy using the Bernanke criterion. Yes, even today. But why did rates fall on the easing of monetary policy? Because the liquidity effect outweighed the income and expected inflation effects. Consider the Fed’s options in 2003. It could have aimed for a 5% NGDP growth rate over the following three years. It actually produced a growth rate of over 6%. How would interest rates have been different if the policy generated an expected 5% NGDP growth rate? Hard to say. The slightly tighter money would have resulted in slightly higher nominal interest rates. The slightly lower expected NGDP growth would have resulted in slightly lower nominal rates. The net effect? I can’t say, I’m not even sure whether rates would have been higher or lower with slightly slower NGDP growth. In 2013. In 2013. In 2012. In 2012. In 2012. In 2012. That’s not to say that Japan has not caused me to rethink my estimates of various parameters. Back in 2009 I would have expected that a few years of 4% NGDP growth would have raised 10 year bond yields above 2%. I now realize that real interest rates have been on a steep downward trend for 30 years, which shows no sign of turning around. If 4% NGDP growth is consistent with 10 year bond yields under 2% in the US, then a 2% NGDP growth rate in Japan might be consistent with 10 year yields under 1%. I have certain core beliefs, such as the view that monetary policy drives NGDP, and that it’s silly to use fiscal stimulus when monetary policy is much less costly. Or that large and persistent increases in NGDP growth tend to raise long term interest rates. Or that market indicators give us the best reading of the impact of monetary policy. I do not have strong beliefs on whether the fiscal multiplier is exactly zero at a particular time or place. Or whether a given change in NGDP growth will result in precisely a one-for-one change in long term bond yields. Or whether the liquidity effect will outweigh the Fisher and income effects in any particular case. If NGDP growth during 2013 is less than 4%, or if RGDP growth is less than 2%, then I believe fiscal austerity will have reduced growth somewhat. In other words, I believe the Fed will have failed to offset the expected fiscal austerity with its QE3 policy of late 2013. This entry was posted on April 04th, 2013 and is filed under Misc., Monetary Theory. You can follow any responses to this entry through the RSS 2.0 feed. You can leave a response or Trackback from your own site. Some commenters (such as Bob Murphy) seem to think I believe that nominal interest rates are a good indicator of the stance of monetary policy. That’s probably because I often quote Friedman saying that ultra-low nominal rates are a sign that money has been tight. I still believe that, but Friedman didn’t think rates were was a reliable indicator of the current stance of monetary policy, and neither do I. Just to avoid future misunderstandings, the stock market and foreign exchange market are reliable indicators of the *current* stance of monetary policy, right? In response to a surprise central bank announcement, you think speculators almost immediately update prices of stocks and currencies. But they wait a year or two before turning their attention to bonds? Nice post. Again I think you would make this clearer if you elaborated on the triggering mechanism by which monetary policy causes an increase in NGDP. Namely, OMP causes an increased exchange of financial assets for real goods and services by a) raising the real the price of financial assets and/or b) changing expectations for NGDP. Depending on how expectations for NGDP change, it’s entirely possible to have an increased exchange of financial assets into real goods and services even while the real price of financial assets is falling. Any movement along the Y Axis toward the origin represents an decrease in financial assets held (i.e. an exchange of financial assets into real goods and services) and thus results in a marginal increase in NGDP. Moving either up the X Axis or out the Z Axis will cause this marginal exchange to occur. You need to look at real risk adjusted returns. The impact of higher NGDP is amplified on equity prices so that can easily outweigh the liquidity effect. Bond returns on the other hand are not impacted by directly higher NGDP. Dtoh, then say the same thing to Scott. In this post I give an example where bond prices moved the “right” way after a surprise Fed announcement, and Scott seemed to think this was worth mentioning. Clearly Scott misunderstood Scott’s position on nominal rates and current monetary policy. I think Scott clearly understands this. If I were to summarize his position, I think he would say “Long term accomodative monetary policy leads to higher real rates (lower prices). Short term, unexpectedly aggressive CB moves will usually (but not always) lead to lower real returns (higher real prices) on financial assets and this effect will be amplified on stock prices because equity returns are highly correlated with NGDP growth. As I have said about hundred times, if Scott put a little more effort into explaining the triggering/transmission mechanism for monetary policy, all of these discussions would become very clear and go away. I should probably have said corporate profits are highly correlated with NGDP growth. The problem here is that Dr. Sumner wants it both ways. He wants to be able to say his theory predicts falling bond yields with bond purchases, and he wants to be able to say his theory predicts rising bond yields with bond purchases. Whatever happens, that’s what he predicted. This is why the use of the terms “usually”, “generally”, “typically”, and so on. That’s fine as far as it goes, but it’s his responses to critics that are weird. When his critics say bond purchases makes bond prices rise, he bites their heads off and says no, that’s incorrect theory. He says “inflation hurts initial receivers”, and “bond prices fall with bond purchases”, and so on. And then when Japan announces bond purchases, and bond prices rise, he still declares victory. If the theory is that bond purchases can make bond prices rise, or can make them fall, depending on the circumstances, then Dr. Sumner is intellectually obligated to stop claiming that bond sellers don’t benefit from OMOs and are harmed by them, period end of story. More productively…what if the liquidity effect happens to be maximally significant with bond purchases and the inflation premium effect happens to be attenuated, for long stretches of time, say in the years? Can we grant that as a possibility? If so, then does MM theory say anything with regards to how that will affect the structure of the economy? Or is it too insignificant to even bother with it? That as long as NGDP keeps chugging along at 5%, that it doesn’t matter if the liquidity effect or the inflation premium effect dominates? That it won’t matter in the real estate or stock markets if interest rates are 1% (liquidity effect) or 10% (inflation premium effect), that the CB should ignore real estate or stock market booms, because via EMH investors are able to discern from nominal rates what the real market rate is, and invest in sustainable ways so that no bubbles are possible? Your bad a priori analysis does not invalidate my a priori knowledge. Dr. Murphy asks a good question. If low interest rates are a signal that money *has been* tight, then that implies bond yields are part of the dreaded “long and variable lags”. Why don’t bond investors immediately adjust bond prices, the way they adjust stock and FX prices? Does EMH not apply to bonds? Or it does, but only if bond prices immediately fall with unexpected inflation announcements? If they rise, then is EMH in a sort of pergatory, and after some time of who knows what happens, finally, bond investors jump out of their chairs and say gadzooks! Bernanke loosened money last year! I better start repricing these bonds! But aren’t the people who price stocks and FX, often the same people who price bonds? What a priori analysis? What a priori knowledge? I guess I don’t understand the fascination with Cantillon Effects. If I’m short the S&P 500 index and the Fed juices the economy with OMP, I’m going to lose money. No rocket science here. If I’m short Treasuries, probably I’m going to lose money too. Again, I’m not sure what you’re getting at. Could you succinctly state the point you’re trying to make. 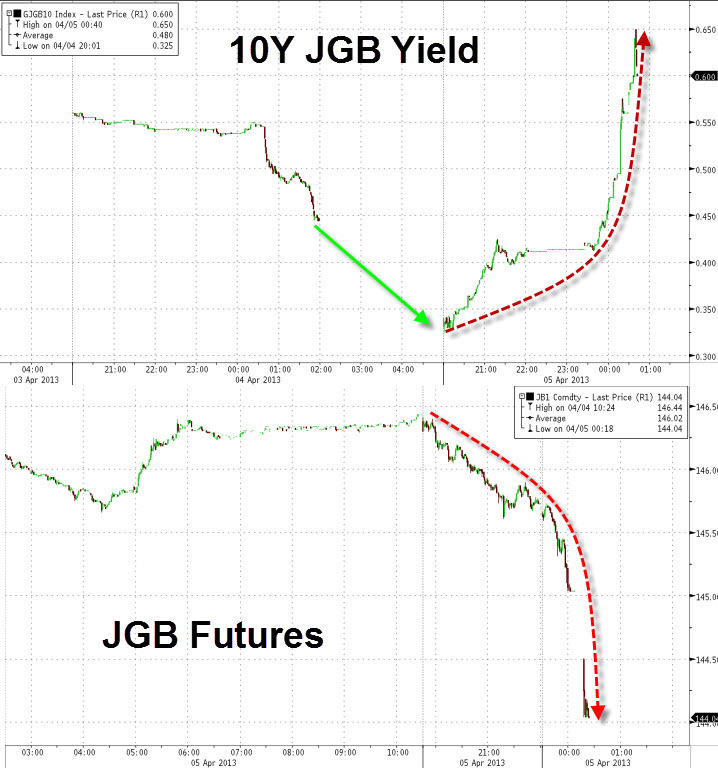 I’ll point out that JGB yields doubled this afternoon. 1) Corporate profits rise with rising NGDP, which has a big impact on return and price. The principal and coupon payments on bonds don’t change regardless of NGDP. 2) Similarly you have to look at the real price of bonds. If inflation expectations have gone from -1 to +2%, you’ve effectively cut the real annualized return by 3% so even if there is little change in the nominal price, there’s been a rather large change in the real price (e.g. 1/(1 – real irr)). 3) You need to look at the relative duration of equities versus bonds. I’m not sure what you’re getting at with these comments. OK, you’ll lose with those investments. So what? My points were made in the post above. I don’t know what point you’re referring to. Wait, they do? If they do, then how does “Low interest rates signals money *has been* tight” make any sense? Wouldn’t it be the case that low interest rates means money IS something or other? Why do bond prices react so slowly relative to equity and FX prices? No, but the market prices supposedly change, don’t they? Bond yields are a function of at least three variables, principle, coupon, and price. This assumes no change in bond prices. But that’s the issue at hand. You said that bond prices immediately adjust, so if inflation changes, then bond prices should change, and real returns should be no different. Equities don’t have durations. Well, preferred shares do, but not plain vanilla equities. I don’t see the relevance of this point. Look, if it’s real yields and real interest rates that we should be looking at, then that is something for you to tell Dr. Sumner, because he tends not to do that. He looks at nominal yields and nominal interest rates almost every time when it comes to inflation announcements and bond prices/yields. TAKE THAT CANTILLON EFFECT FANS! I often point out that on a few occasions easy money policy announcements have actually raised long term bond yields. Nah, c’mon Scott, I’m 98% sure that in your debate with me over Cantillon effects, you said the usual outcome was rising long-term yields. Not that it was some freak thing that could conceivably happen. I think you may have spoken too soon professor. “The 10-year yield climbed 18 basis points to 0.615 percent in the afternoon session after dropping as much as 12 basis points in the morning to a record low of 0.315 percent. Article on page two of the widely read free “City AM” newspaper given out at all stations into London. The young tyro journo just cuts and pastes a large chunk out of your blog! But his bullet points explaining Kuroda’s policy are very sensible, showing he’s read and absorbed market monetarist ideas. We’re still waiting for Carney over here. While Draghi over the Channel can do some good, but has been undermined by the loss of his political backers in Italy. Instead has to wait for his opponents on the ECB Council and in the Finance Ministries to slip up, which they did over Cyprus, tragically. But he may be running out of time as forward economic indicators for Europe are looking grim. Being British, I blame the French, mostly, they seem keen to emulate their tragic experience of the 1930s, in an attempt to be more German-like. Yet the Germans constantly surprise with their pragmatism when their own economy is under threat, so maybe we will see some sensible action yet. You need to look at risk adjusted expected real IRR. This should be obvious. Why does a yield change cause a larger price movement in the long bond than in a T-Bill? You need to do an IRR calculation on expected cash flow. If NGDP expectations go up, equity cash flow expectations go up. Doesn’t happen with bonds. Bond prices as measured as expected real IRR adjust immediately. Nomimal bond prices can change based on changes in expected inflation as well as other factors impacting supply and demand. Nominal prices by themselves tell you very little. Yes and maturity, but unlike corporate profits none of these change as a result of a change in expected NGDP. I said (or implied) that the market price as measured by real expected IRR will change which may or may not cause a change in the nominal price depending on other factors including expectations of what increased/decreased NGDP will do to credit demand. Correct, but for a financial instrument with payments over a long period of time, price will generally be more sensitive to equivalent changes in risk adjusted market rates of returns. Sure sometimes he is not as precise as he could be, but it’s pretty clear from his posts that he understands and normally makes the distinction. Let me put a simple question to you. Do you believe a CB can control the path of NGDP by using OMO? Why don’t bond prices immediately fall? If the prices change immediately, then how do you explain: “Low interest rates means money has been tight”? Even making the distinction, it doesn’t add up to me. If the argument is that current interest rates are a function of past monetary policy changes, then that implies bond prices don’t immediately adjust to monetary policy changes. No. Why? I look at its past ability to control every other historical target it has tried. They’re all over the place. I think to myself why would NGDP be any different? Short term supply and demand balance determines price. Even though supply will probably increase over time due to an increase in credit demand because of higher NGDP growth, it may fully reflect in the current price because of uncertainty over timing, Fed commitment, exongeous factors, carrying cost, etc. You know all this stuff. Why are you asking rhetorical questions. Prices (expected real IRR) change immediately to meet changed expectations, but that doesn’t mean the market expects 100% certainty of 5% NGDP growth starting tomorrow. Expectations have to be about something real. NGDP growth actually does go up, real rates go up. NGDP goes down, real rates go down. I think don’t “fully” adjust to monetary policy change. If monetary policy was run by a open algorithm on a server, I think you would see fuller adjustment. As it, the market recognizes there’s a risk that the Ron Paul contingent could take over monetary policy. So you agree with the theory (i.e. an increase OMP will result in increased NGDP), you just don’t think the Fed will carry out this policy? I am trying to reconcile the notion that bond prices immediately adjust as per EMH, with the notion that bond prices are slow to adjust such that we talk about interest rates being low today due to monetary policy activity in the past. Ignore 5% NGDP for a moment. Given an inflation announcement of OMOs of $X, which is 100% certain, how can you reconcile immediate price changes with OMOs of $X, with rates today being a reflection of past monetary policy? Given that an inflation announcement is made, and is credible, would bond prices immediately and fully adjust then? If there is always the risk of a change in monetary policy from Ron Paul type contingents, then wouldn’t that imply there is *never* a full adjustment to bond prices, which implies bond prices change over time after a phenomena has occurred, which implies the theory of “long and variable lags” is valid? When you put it that way, I’m even less inclined to agree, because cash preference can increase and offset the OMO, in terms of spending. If what you mean is do I agree that the CB can increase NGDP given its OMOs exceed any growth in cash preference? That it’s trivial. Fundamentally, I do not regard the CB as omnipotent, when it comes to target hitting. Also, there’s a difference between raising NGDP, and targeting NGDP. More fully, but nothing is 100% certain. E.g. algorithm might have a bug, you don’t know how a specific amount of inflation will equate to real growth and real credit demand, consumer preferences might change, etc. Also I think you would see rates adjust over time as actual credit demand is likely to change over time rather than instantaneously. (Think about it his way… if you’re a speculator at what price would you short a bond now knowing you can buy it back at a lower price X in 2 years time. It depends on your carrying/ opportunity cost so I think if the expectations about future price X changed, you would see a movement in the direction of X but not all the way to X). Cash preference can increase or excess reserves can increase…. but we know the CB can reduce excess reserves by setting negative IOR or just setting a fixed reserve ratio (i.e don’t allow excess reserves), and we know that cash preference will decrease if inflation expectations go up. If this is correct, I think we have to agree that’s it’s trivial for the CB to increase NGDP through OMP??? I think you were right in 2009 Scott, about 4% NGDP growth leading to yields over 2%. Its just that you didn’t foresee the ECB’s war on Europe. If one were to plot the U.S. 10-year and the Spain spread along with TIPS spreads(after Evans-Bernanke), one would see that the 10-year is still tightly correlated with Spain, but that TIPS are not. Care to square your take on how bond prices fall when the central bank starts buying them with the unprecendented rally in JGBs? If nothing is 100% certain, then completely fully prices as in prices that reflect 100% certainty, don’t exist. In other words, REAL WORLD prices can completely fully adjust, if we make sure to realize that completely fully adjusted prices is concomitant with whatever degree of certainty actually exists. Else, you’re using an irrational standard to judge prices. So given monetary policy today, and given that requisite information for fully completely adjusted bond prices is “released” over time, it follows that bond prices don’t immediately adjust, contrary to your original claim that they do. You do realize you’re saying mutually exclusive things, don’t you? First you said rates adjust immediately, now you’re saying rate adjustments take time. Yes yes but the question is how much cash preference (and other variables) change, such that a given OMO can’t be connected to a given rate of inflation. Increasing NGDP is one thing. Targeting it is another. Nobody denies that the Fedsters have the ability to raise price inflation they want. But will they target price inflation? Nobody denies that they have the ability to raise NGDP. But will they target NGDP? They haven’t successfully targeted anything ever, and if we assume history is any guide, what makes NGDP targeting any different? If the Fed does start to target NGDP, there’d probably be fluctuations in it just like there are fluctuations in price inflation targeting now. Bob, None of those three markets are reliable indicators of the stance of monetary policy. For instance in recent years stocks have rising sharply while money has remained tight. I believe NGDP is the most reliable indicator. All three markets respond immediately to monetary policy announcements. There is no lag. Expansionary monetary surprises tend to raise stock and forex prices, but the effect on nominal interest rates is ambiguous. It depends on whether it’s a one-time shock, or if it’s seen as something that will dramatically raise trend NGDP growth. dtoh, I don’t follow. Who exchanges financial assets into real goods. Everyone, I’ll do another post and try to explain this more completely. I don’t think so. Rates adjust immediately to changed expectations, and then over time they adjust to changed actual demand for credit. I don’t think that’s mutually exclusive. If we disagree at this point, I think it’s semantics. We both agree on what actually happens. “Increasing NGDP is one thing. Targeting it is another. Well wouldn’t you agree that just as increasing NGDP with OMP is possible, that a CB can decrease it with OMS. If so doesn’t that mean you can target NGDP. (How well is a separate question). Well maybe up until now they have always targeted the wrong thing, but NGDP is the right thing. To me anyway after thinking about it for quite a while, NGDP seems like the right thing. Not to put words in your mouth, but it sounds like you agree with the logical underpinnings of NGDPLT, but you don’t think the Fed is competent to carry it out? If the real price of financial assets rises relative to the price of good and services than there will be a marginal increase in exchange of financial assets into real goods and services. Could be a company investing in a new production line. Bill selling MSFT shares to buy a Ferrari. New home buyer. Increase purchases on a credit card. Etc. Etc. “I believe NGDP is the most reliable indicator.” Don’t you mean, “NGDP *expectations* (for a year or two out)”? I was specifically talking about the inflation announcement only. Not the other factors. Obviously bond prices will move on future events. If you agree that bond prices instantly adjust to inflation, then how can that reconcile with the theory that low interest rates today means inflation in the past has been tight? Just consider inflation, not subsequent credit events or supply and demand. The two claims here are not capable of both being true. Put it this way. Grant yourself the assumption that you can potentially increase the number of murders, by going out and shooting people. But, does this mean that you will succeed in targeting a rate of 100 murders a year, if that’s what you wanted to do? Try not to consider the content of this analogy, so much as seeing the difference in form between the two. How is considering NGDP targeting “the right” target, synonymous with that target being targeted? It’s more than that. I think it is counter-productive (except if I had control of it). How is it more expensive at theses rates? People are paying us to take their money. Down the road maybe ? But I don’t see interest rates going up with out growth going up. So rising growth should cancel out the rise in interest. One of the first things I argued for on these threads was to DO BOTH… Do expansive monetary policy and Stim. I still feel that way. Although now, at least as far as the American recovery is concerned, five yeas after action should have been taken… I would be more cautious. Too bad all those years have seen so many lives needlessly harmed. You said that corporate profits are highly correlated with NGDP growth. Obviously with more money in the system and prices rising, profits are probably going to get a boost from inflation. However, if memory serves me correctly, the 1970s were not a good period for equities and corporate profits despite high NGDP growth while the recent post-recession years have been excellent for corporate profits despite lower NGDP growth? What gives? Is the correlation broken? I think this whole discussion would end if both sides would admit that market reactions have a high degree of randomness. If they didn’t, it would be possible to systematically beat them with economic knowledge. However, trying to make money based off of economics, no matter how sound your calls are, has been shown to be very difficult. For instance, currencies can stay out of line with fundamentals for years like the U.S. Dollar in the 1980s before correcting. Even if you’re right that the dollar is overvalued, you can still lose your shirt in that trade. dtoh, If someone sells financial assets, who buys them? It seems to me your argument has nothing to do with financial assets, rather you are arguing that real output rises. Philo, Yes, but I often leave that out as we don’t know what it is, so it’s easier to just talk about NGDP, especially when talking about ongoing policies for an extended period of time. But you are correct. Bill, Even if the current interest rate is zero, fiscal stimulus is costly. In the future taxes will have to be raised to pay off the debt, or to service the debt when rates rise. So when I refer to the sale of financial assets, I’m talking about any net reduction in holdings of financial assets by the non-financial sector. For example, the sale of Treasuries I already hold, new bank borrowing, issuance of equity, etc. all would be a reduction in financial assets. If I sell Treasuries I hold to you, there is no reduction in net asset held by the non-financial sector. If I borrow money from the bank, there is a reduction (assuming fractional reserves and the bank doesn’t fund the loan entirely by taking in a new deposit in an identical amount). If you sell Treasuries to a bank who sells them to the Fed, there is also a net reduction. Any time the real price of financial assets rises relative to the price of real goods and services you will at the margin have an increased exchange of financial assets into real goods and services…i.e. an increase in NGDP. I don’t understand. NGDP tends to fall when long term bond yields fall. That’s because lower bond yields reduce velocity, and hence NGDP. And lower long term bond yields mean higher bond prices. In theory yes, but IMHO the effect is minimal especially at low nominal rates of interest and when the change in yields is small. There are also two other effects. 1)If real yields fall (real financial asset prices rise), then the price of financial assets has risen relative to the price of real goods and services so there is a marginal increase in the exchange of financial assets for real goods and services (unless you don’t believe in indifference curves). 2) If the fall in yields is a result of OMP and that same OMP has also caused increased expectations of higher NGDP, then you will also see an increased exchange of financial assets for real goods and services. Both 1) and 2) increase NGDP. dtoh, Let’s pick this up with the newest post.